Skeletal muscle breakdown is expected following an ultramarathon, and very rarely leads to clinically significant exertional rhabdomyolysis. Rhabdomyolysis can cause kidney failure or heart stop in the worst cases. Signs of clinically significant rhabdomyolysis during or after a race include generalized muscle pain or weakness out of proportion to the effort, cola-colored urine, or the inability to urinate 12 to 24 hours post-race. Clinically significant rhabdomyolysis can occur alongside low blood-sodium levels due to overhydration, adding complexity to the health emergency. Specific training and proper hydration are among the chief ways of avoiding this illness. It was his third time running the race, and this time he was easily on pace for a course record. It was a mountainous 100 miler that no one finishes in under 24 hours, but at mile 70, it still looked like he might. He felt incredible. As he crested yet another peak with a stunning vista, it dawned on him that this might be the race of his life. JH is a runner I came to know because he was hospitalized for rhabdomyolysis. He wishes to remain anonymous for the purposes of this article, so some of the details of his story have been changed to respect this wish. A mutual friend put is in touch when he wanted medical advice. It was somewhere around mile 80 of the race that things started to go wrong–very wrong. There was an extremely steep downhill at this point and he kept falling backward, which was strange for him. But then, when the trail flattened out, it became clear that what he was experiencing was not within the realm of normal–even for an ultrarunner. He fell hundreds of times. His pacer, also a very accomplished runner, was worried he might get a head injury or fall off a cliff. JH kept going, though he had to walk most of the last five miles; his legs simply did not have the coordination required to run. His pacer suggested he drink or eat, but drinking sounded terrible. He had been forcing down energy drink and salt tabs, but, if anything, they made him feel worse. With five miles to go, he began to vomit. His wobbly hobble across the finish line was met with huge cheers–he had won and set a new course record, though missed coming under 24 hours. He smiled and hugged his wife and thanked the race director, but he could not keep standing and went directly to his hotel room. Another 24 hours later, he had still not urinated and the nausea continued. Anytime his wife tried to get him to drink anything, he would start to vomit. When I asked JH to tell me his story, I expected the classic story of rhabdomyolysis: muscle pain and cola-colored urine. But what he described reminded me much more of exercise-associated hyponatremia (dangerously low sodium levels in the bloodstream), with his inability to control his legs, nausea, and aversion to water. Let’s back up. What is rhabdomyolysis and how would we know if this was JH’s problem? The word “rhabdomyolysis” is Greek for “striated (skeletal) muscle breakdown.” Skeletal muscle breakdown is abnormal in a resting person, but normal following any sort of exercise that is longer or more intense than a person is accustomed to. Thus, a certain degree of skeletal muscle breakdown is expected from an ultramarathon. Creatine kinase (CK) is an enzyme that is released into the blood following muscle breakdown. Outside of exercise, a CK greater than 1,000 U/L (units per liter) is concerning for rhabdomyolysis. Following exercise, however, there is no consensus about a threshold CK level that is concerning. Indeed, after an ultramarathon, a CK of greater than 100,000 has been frequently observed without apparent health consequences (Hoffman, 2012). While there are many causes of rhabdomyolysis (see Figure 1), some related to exercise and some not, for the purposes of this article, we are discussing the syndrome of exercise-related rhabdomyolysis, better known as exertional rhabdomyolysis. In order to diagnose exertional rhabdomyolysis, or what some refer to as “clinically significant exertional rhabdomyolysis,” it is generally agreed upon that one must have BOTH a laboratory value showing excessive muscle breakdown and the “appropriate clinical presentation.” This clinical presentation could include muscle pain, stiffness or weakness out of proportion to the exercise performed, or “cola-colored urine*” (Szczepanik, 2014). *Cola-colored urine is caused by myoglobin, a protein released during muscle breakdown that, if present in a high-enough amount, gives the urine a cola color. Of note, though, myoglobin is also expected to be elevated following an ultramarathon. Indeed, 33 of 34 test subjects who had just completed the London Marathon had elevated myoglobin levels to the point that it was above the laboratory’s measurable range (Smith, 2004). Figure 2. The creation of cola-colored urine in rhabdomyolysis. Image courtesy of Gomerpedia. Why is Rhabdomyolysis Potentially Dangerous? When skeletal muscle cells break apart, they release electrolytes and myoglobin (see Figure 3). As previously mentioned, myoglobin is a protein that is not normally found in the blood that, when released from broken-down muscles, can precipitate (crystallize) and block the tube-like filters of our kidneys, causing urine to appear like cola. A sufficiently large amount of myoglobin can damage the kidneys to the extent that they stop functioning entirely. Also, electrolytes like potassium and calcium can build up in the blood and put a person at risk of irregular heartbeats (which, in the worst circumstance, can stop the heart). Figure 3. A detailed diagram showing how exercise can cause damage to muscle cells and how these damaged muscle cells release toxic molecules and electrolytes which can lead to kidney damage, easy blood clotting. and an irregular heart rhythm. Rhabdomyolysis was initially called “crush syndrome,” when in 1940, during the London Blitz of World War II, a large number of peoples’ limbs were crushed. These patients survived the crushing, only to die of kidney failure several days later. The causes of rhabdomyolysis are numerous and can include direct muscle injury (e.g., electrocution, burns, etc. ), loss of blood flow to muscles, infections, muscle and immune-system disorders, drugs (e.g., statins), toxins (e.g., hemlock, toxic mushrooms), and some venoms. 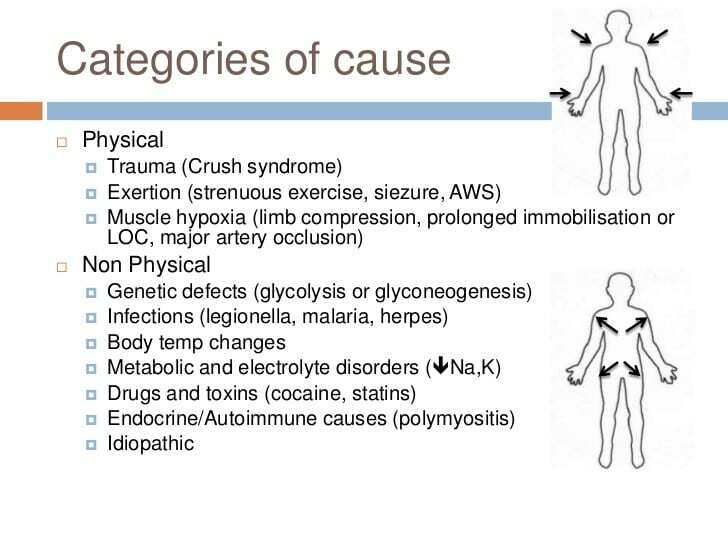 And many different genetic conditions can predispose a person to the development of rhabdomyolysis. Figure 4. 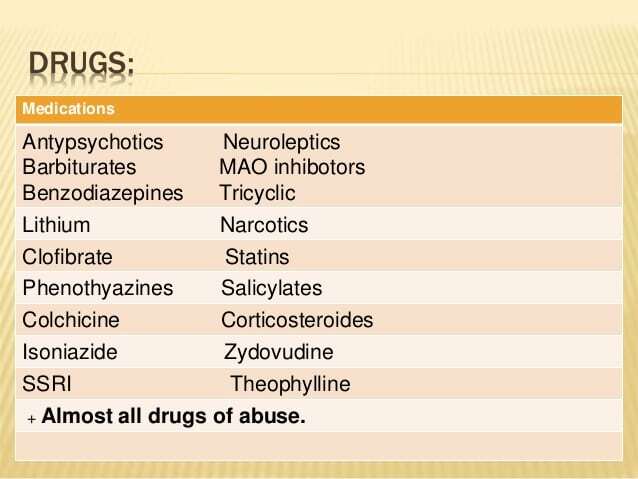 Drugs that can cause rhabdomyolysis (even in the absence of exercise). Figure courtesy of Dr. Xenia Klein. Classically, exertional rhabdomyolysis occurs with excessive and/or repetitive exercise, particularly with significant eccentric exercise. (Eccentric contraction happens when a muscle lengthens despite contraction, such as the quadriceps when running downhill.) There are approximately 26,000 cases of exertional rhabdomyolysis yearly in the U.S. that necessitate hospitalization (O’Connor, 2012). There have been ‘outbreaks’ related to extreme exercise, such as repeated triceps drills and pushups in football players and upper-extremity exercises in swimmers, to name a few. And the New York Times recently published an article about the rise of rhabdomyolysis after spinning classes, CrossFit, and other ‘weekend warrior’ activities. The author of this article personally developed rhabdomyolysis after holding a surgical retractor in the same position in the operating room during a 12-hour surgery. I did not drink or eat during the entire case. Being the wise runner that I am, I immediately went out for an hour-long run, only to start peeing cola-colored urine when I got home. I was a medical student and knew enough at the time to be concerned about rhabdo. To be on the safe side, I went to the emergency room, where myoglobin was found in my urine. I received a bag of intravenous (IV) fluids and, when I started peeing yellow, was released home. Despite the excessive, prolonged exercise involved in running an ultramarathon, it typically does not result in clinically significant exertional rhabdomyolysis. In other words, there can be evidence of significant muscle breakdown, but no signs of detrimental health effects. And, to my knowledge, no deaths have occurred due to ultramarathon-related rhabdomyolysis. That is not to say that exertional rhabdomyolysis does not happen in ultrarunners; however, the diagnosis of exertional rhabdomyolysis (that is significant) is very challenging given the laboratory values typically used to diagnose exertional rhabdomyolysis are expected to be abnormal after an ultramarathon. Again, a CK greater than 366 U/L for adult men and greater than 176 U/L for adult women is considered abnormal in a resting state and a CK greater than five times the upper limit of normal is diagnostic for non-exertional rhabdomyolysis. We know, for example, from the 2010 Western States 100 that the average CK blood level immediately post-race was 32,965 U/L and ranged from 1,500 to 264,300 U/L. No cases of acute kidney injury were reported from that year. It can also be difficult to know when a runner crosses the line from a normal physiologic response to running an ultramarathon to exertional rhabdomyolysis. For example, delayed-onset muscle soreness (DOMS), experienced a day or so after strenuous exercise, is an indicator of muscle damage and signifies a very mild form of rhabdomyolysis. However, this only becomes worrisome when the pain is severe, you start having cola-colored urine, or you start swelling or stop peeing (the latter two suggesting possible kidney failure). Kidney failure is also very rare (only 19 cases among more than 100,000 runners of the Comrades Marathon over 18 years) and it is not known how often rhabdomyolysis is the cause of this kidney failure. Figure 5. 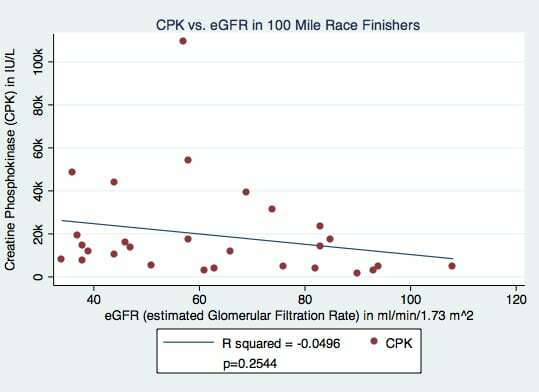 2017 Western States kidney function (shown as eGFR or the rate at which the kidney is filtering) immediately post-race was not significantly correlated with CPK (aka CK) levels. Of the participating runners in our 2017 study, none developed kidney failure. 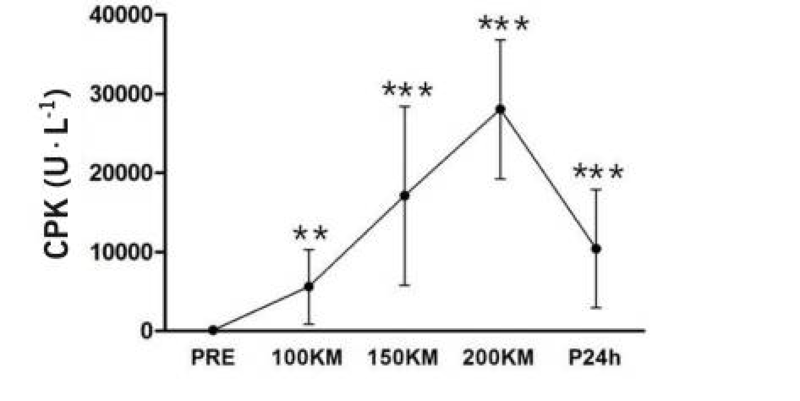 Basically, what this graph shows is you can have a heck of a lot of muscle breakdown without any obvious effects on your kidneys, at least at the finish of an ultramarathon. 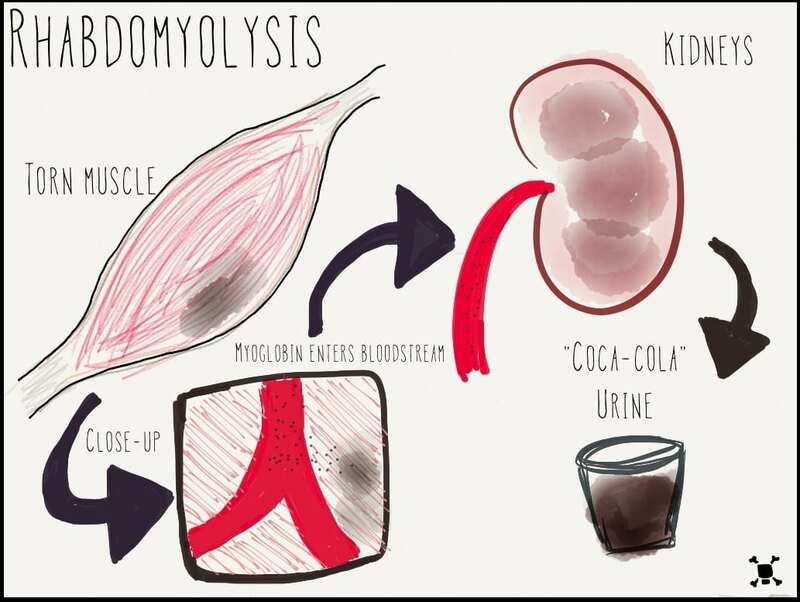 However, kidney failure can still occur a couple days later, at which a person could be diagnosed with rhabdomyolysis-induced kidney failure if the CK is still elevated and/or there is myoglobin in the blood or urine. Unfortunately, post-race CK levels have not been shown to be helpful in predicting who will go on to get kidney failure (Brusso, 2010). If you are concerned about kidney injury following an ultra, a urine dipstick done post-race has been found to be helpful in predicting who might go on to develop kidney failure (Hoffman, 2013); if you are concerned about kidney failure or rhabdomyolysis post-race, this is a good screening test but is generally not available at a race’s finish line. Data from a 200-kilometer race in Ceju, South Korea (see Figure 6) indicated that CK, on average, decreases significantly 24 hours post-race. They postulate this may be due to increased clearance of breakdown products because of improved hydration post-race more than an actual decrease in muscle breakdown. These data suggest that, if there is no kidney failure, that CK continues to fall post-race, at least at 24 hours post-race. In other words, what this research tells us is that a CK level that continues to rise greater than 24 hours post-race is concerning, as it may be a sign that the kidney is not filtering out the CK as it should (Scalco, 2016). Two signs that your kidneys might not be functioning properly are no or very little urination or generalized swelling. Let’s consider the stories of three racers completing a 100-mile race. Which one of these has/have exertional rhabdomyolysis? Runner A finishes a 100-mile race in 28 hours and on post-race blood draw is found to have a CK of 104,000. He otherwise feels tired and sore, has a blister on his foot, but no other complaints. Runner B finishes the same 100 miler and collapses, complaining of severe fatigue and whole-body aching. You are not able to obtain blood for a blood draw, but he is peeing cola-colored urine and he has myoglobin in his urine. Runner C finishes the 100-mile race and is throwing up and has trouble walking straight. You also get a post-race blood draw on him and his CK is 55,000 and his sodium is very low. His kidney function is normal. The answer is B. This is important, because this person needs to be sent to a hospital. Provided their sodium is not too low, they should receive IV fluid treatment and additional testing of electrolytes and kidney function. Runner A has no worrisome symptoms and an elevated CK alone is not sufficient to warrant any further work-up or treatment at this time. Runner C has exercise-associated hyponatremia (low sodium), which is life threatening and, very importantly, despite the elevation in CK, this person should not receive isotonic IV fluids for his CK because this could actually lower the sodium further and cause pulmonary edema, seizures, or death. Hypertonic (3%) saline IV fluid should be given in this case. JH was brought in for medical care around 24 hours after his race finish. He had not peed since early in the the race. The medical personnel assumed he was dehydrated given the race distance/time and that he was vomiting. They gave him one bag of IV normal saline after another. He became progressively nauseated and swollen. Then he got short of breath. Around this time, his initial lab results came back and he had critically low sodium. He was then transferred emergently to a critical-care center, where in addition to the critically low sodium, he was found to have elevated CK, myoglobin in his blood, and significant kidney damage. He began to develop significant muscle pain over the next few days. He went on to require dialysis until, thankfully, his kidney function returned weeks later. He said that, the first time he peed, it was cola-colored. What can we learn from JH’s case? Clinically significant exertional rhabdomyolysis can occur following an ultramarathon, though it may be more likely or equally likely to occur with overhydration as dehydration (Brusso, 2010; Chlibova 2105; Hoffman, 2015; Putterman, 1993). The extreme effort, long duration, and large amount of eccentric movement while running in the mountains, in addition to admitted NSAID use among many ultra participants, were all likely risk factors for rhabdomyolysis in this case. Drinking despite not being thirsty (even with the addition of salt tabs) likely worsened the low sodium level. It was not entirely clear whether the low sodium from overhydration or the muscle-cell breakdown comes first, but it has been proposed that low-sodium levels cause muscles cells to break down easier (Chlibova, 2015; Noakes, 2012). Alternately, the inflammation of the muscle breakdown may worsen the hyponatremia (low sodium). Perhaps it was a case of a vicious cycle with JH. When Should Runners Worry About Exertional Rhabdomyolysis and/or Kidney Injury? You are experiencing muscle soreness out of proportion to that expected from the race you just ran. This could indicate muscle breakdown significant enough to cause kidney damage and/or electrolyte abnormalities. You are peeing cola-colored urine. This is likely from myoglobin leaking from your muscles, through your kidneys, and into your urine. It may also be a sign of accompanying dangerous electrolyte abnormalities. Loss of balance, control of your limbs, nausea, water aversion, headache, and seizures are all potential signs that you have exercise-induced hyponatremia (low sodium). This is life threatening and should not be treated with normal (isotonic) saline IV fluids (which could be fatal), but 3% hypertonic saline should be used. Sodium levels must be checked in any runner who is suspected of having rhabdomyolysis before IV fluids are given. 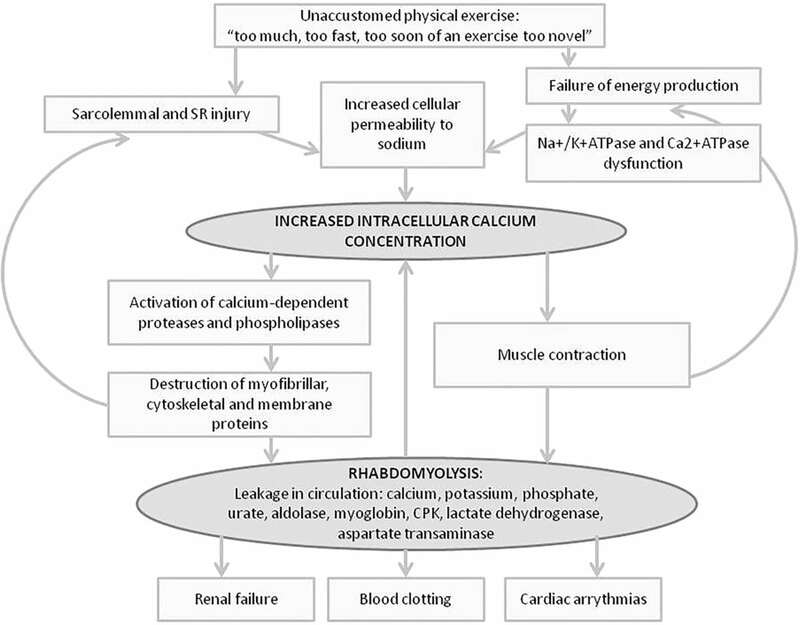 How Can You Prevent Exertional Rhabdomyolysis Plus or Minus Kidney Injury in Ultrarunning? Train for the terrain you plan to run in. Repetitive unfamiliar stress to any muscle group can set you up for rhabdomyolysis. Drink when you are thirsty (avoid dehydration and overhydration) and do not drink if you are not thirsty to avoid developing a low sodium level. If you have developed exertional rhabdomyolysis plus or minus kidney failure before, avoid use of NSAIDs while racing. If you have not had exertional rhabdomyolysis, use them very judiciously, if at all, while racing. NSAIDs decrease the kidney’s ability to clear waste products from the blood stream (Farquhar, 1999) and increase the risk of kidney injury (Lipman, 2017). If you are on any prescription medications, determine with your doctor if they are associated with an increased risk of rhabdomyolysis (see Figure 3 above). If you have a fever or systemic infection with or without fever, you are in a pro-inflammatory state, putting yourself at higher risk of exertional rhabdomyolysis and probably should not be racing while your body is attempting to recover. If you have had recurrent exertional rhabdomyolysis, especially with low amounts of physical activity, seek medical assistance in figuring out why. A CK that does not return to less than five times the upper limit of normal despite two weeks of rest will require further work-up for genetic predisposition to exertional rhabdomyolysis. If you or someone in your family has sickle-cell trait (or disease), you are at much higher risk of developing severe and recurrent rhabdomyolysis. If recurrent rhabdomyolysis runs in your family, you may consider genetic testing to learn why and if you are at risk. Please also note that salt tabs and salt supplementation have not been found to be effective or necessary in the prevention of exercise-associated hyponatremia. The most important treatment is to avoid drinking if you are not thirsty. Low sodium tends to happen because of overhydration. Have you experienced race-related rhabdomyolysis and/or kidney failure? Please share your story with us so we can learn more about this still somewhat enigmatic entity in long-distance runners. Bruso J.R., Hoffman M.D., Rogers I.R., Lee L., Towle G., Hew-Butler T.
(2010) Rhabdomyolysis and hyponatremia: A cluster of five cases at the 161-km 2009 Western States Endurance Run. Wilderness and Environmental Medicine, 21 (4) , pp. 303-308. Chlíbková, Daniela et al. “Rhabdomyolysis and Exercise-Associated Hyponatremia in Ultra-Bikers and Ultra-Runners.” Journal of the International Society of Sports Nutrition 12 (2015): 29. PMC. Web. 15 Feb. 2018. Farquhar WB, Morgan AL, Zambraski EJ, et al. Effects of acetaminophen and ibuprofen on renal function in the stressed kidney. J Appl Physiol. 1999;86:598–604. Harpaz, Rave & DuMouchel, William & Shah, Nigam & Madigan, David & Ryan, P.B. & Friedman, Carol. (2012). Novel Data-Mining Methodologies for Adverse Drug Event Discovery and Analysis. Clinical pharmacology and therapeutics. 91. 1010-21. 10.1038/clpt.2012.50. Hodgson L, Walter E, Venn R, et al Acute kidney injury associated with endurance events—is it a cause for concern? A systematic review BMJ Open Sport & Exercise Medicine 2017;3:e000093. Hoffman MD, Stuempfle KJ, Sullivan K, Weiss RH. Exercise-associated hyponatremia with exertional rhabdomyolysis: importance of proper treatment. Clin Nephrol. 2015;83:235–42. Høeg T, Warrick A. Creatine phosophokinase levels vs. estimated kidney function at Western States 100 mile run 2017. In preparation for publication. Lipman GS, Shea K, Christensen M, et al Ibuprofen versus placebo effect on acute kidney injury in ultramarathons: a randomised controlled trial Emerg Med J 2017;34:637-642. Noakes T. Waterlogged. Human Kinetics: The serious problem of overhydration in endurance sports. New Zealand; 2012. O’Connor FG, Deuster PA. Rhabdomyolysis. In: Goldman’s Cecil Medicine. 24th ed. Goldman L and Schafer AI. Philadelphia: Saunders Elsevier, 2012. Putterman C, Levy I, Rubinger D. Transient exercise-induced water intoxication and rhabdomyolysis. Am J Kidney Dis. 1993;21(2):206–9. Scalco RS, Snoeck M, Quinlivan R, et al Exertional rhabdomyolysis: physiological response or manifestation of an underlying myopathy? BMJ Open Sport & Exercise Medicine 2016;2:e000151. Smith JE, Garbutt G, Lopes P, et al Effects of prolonged strenuous exercise (marathon running) on biochemical and haematological markers used in the investigation of patients in the emergency department British Journal of Sports Medicine 2004;38:292-294. Son H, Lee Y, Chae J, Kim C. Creatine kinase isoenzyme activity during and after an ultra-distance (200 km) run. Biology of Sport. 2015;32(4):357-361. Szczepanik, Michelle E. MD1; Heled, Yuval PhD, FACSM2; Capacchione, John MD3; Campbell, William MD4; Deuster, Patricia PhD, MPH5; O’Connor, Francis G. MD, MPH. Exertional Rhabdomyolysis: Identification and Evaluation of the Athlete at Risk for Recurrence. Current Sports Medicine Reports13(2):113-119, March/April 2014. Super interesting article, thanks guys! After winning Rio Del Lago 100 I peed cola/burgundy urine, but was peeing clear within 6 hours. I couldn’t really sleep so I just kept tanking the fluid. I especially found the part of overhydrating really interesting. Compromising your sodium levels from to much water is to easy to do. Thanks again for the great info! I think this is a great article, but I’m a little worried about what is normal and what isn’t. A couple years ago, it was an exceptionally hot summer, and I had blood colored urine 3-4 times during the summer, after long runs above 25k. I know I was mostly dehydrated and had pushed harder than I should have. Probably not so smart, but it’s focused me on making sure I’m well hydrated before, after and during a run now. I’ve also had the cola-colored urine several times in my running career, but never once have I checked myself in to a hospital to be checked. Feels dumb , but in all cases I was urinating as normal within 6-12hrs after the abnormal urine. And I’m reluctant to repeat this, but after a 32k in snow covered trails (it’s winter in Sweden), I had cola colored urine 2 weeks ago. Despite drinking 500ml of a hyrdration and sodium mix during the run. I attributed that to an onset of being sick, since the following week I had the worst cold of the season (and took a week of from running). So that I feel better, should I be seeing doctors when this happens, or is it “normal” within ultrarunning? Brian, great questions. It sounds like the color of your urine has returned to normal within 6-12 hours on all occasions. Is that correct? It sounds like you got over what may have been mild episodes of rhabdo on your own. The blood tinge may be “March hematuria” hemolysis of blood cells related to break down of blood cells actually in the feet due to prolonged time on your feet. Certainly if you are not able to clear up the cola colored urine or the blood tinge stays in your urine despite rest and rehydration, I would see a doctor. You will probably know within a few hours if your urine is not clearing up on its own at which point you should be seen. Some specific additional advice I would have for you would be to just get a creatinine checked (just to be sure your kidney function is okay), get a resting CPK (aka CK) checked and also a urinalysis just to make sure you do not have blood in your urine at rest. All that being said, I have no reason to think you have anything wrong with your kidneys, bladder or muscles, but I would hate to miss something and the tests I mentioned can be easily done and then you (and I) will have peace of mind. Tracy, thanks for the response, it eases some of the stress that I’ve had with the urine issues. I am a prolific perspirer, and need to be careful of my levels, even during winter. You are correct on all accounts that the urine clears up relatively fast with rest and hydration and that is mainly why I haven’t thought so much about it before. I am glad though to finally understand the real reason behind the cola colored urine as I assumed that had more to do with dehydration than actual muscle breakdown. The tests that you mention, should they be done now, for peace of mind, or at the next instance of cola/blood colored urine? Brian, the idea with the tests is you have them done at your convenience whenever you have a period of relative rest just to make sure you don’t have kidney problems, blood in your urine or muscle breakdown at rest. Getting these tests is not urgent as I suspect this will be normal, but this is mostly for peace of mind for you – and because these are easy tests to obtain. 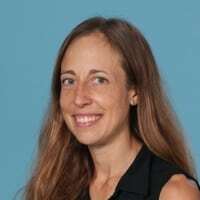 Holly Brooks and Brent Knight both developed rhabdomyolysis while leading the Mt. Marathon race in, I think, 2009. Both collapsed just before the finish. Both were very high level athletes, Olympic hopefuls in cross country skiing (Holly became 2x Olympian afterwards). This was about 45 to 52 minute long race for them, up, then down 3,000 ft in about 5K. 3,000 ft of downhill in less than 10 minute probably did it. It was a warmer day than usual. I think exercise related rhabdo is probably more associated with shorter, more intense running like Mt. Marathon than ultras. I was diagnosed with rhabdomyolysis a few years ago, and it was awful! I was out of work for a month, and felt bad for about 2 months. I am a long distance runner, but at the time was not going farther than marathon distance. Wish I could have read this article then. A very interesting article once again Tracy; thank you for publicising. We first knowingly met with this double whammy of Rhabdo & Hyponatraemia here in Scotland at the West Highland Way Race in 2005. An exceptionally warm & humid (for Scotland..) race start, 18C at 0100hrs became a hot & sultry race, then turned to thunderstorm, sudden drop to 2C & sleet the next night. Two male runners presented at around 75 miles with both heavily coloured urine and significant confusion. Blood testing at a local hospital confirmed the suspected dual diagnosis and led to rapid evac to the regional centre for dialysis and fortunately both recovered after days on high dependency. Some of our races have finish lines quite remote from definitive care, so several years ago we acquired an I-Stat blood analyser from Abbott and use their ‘Chem8’ cartridge for basic U&E. This gives us a field confirmation of diagnosis and allows us to make appropriate disposals matched to the needs of the runners involved. Sean, great to hear from you and thanks for sharing your experience with rhabdo and hyponatremia. Good call with the I stat- makes finish line lab evals a lot easier – and is really helpful in the above situation! Cheers. Hi, interesting article, I have had rhabdo 3 times with CKs ranging from 50,000 to 116,000 caused from high intensity weight training ( ie x fit ). When I was trying to find the cause I worked with dr Corey Cunningham at hills sports medicine and done 6 post race blood tests after exhertive exercise when I had doms and felt significant muscle soreness. I went for blood tests and found my CKs were around 10,000 – 20,000 with only normal doms symptoms which lasted a few days and no rhabdo. I have only ever had it in my arms though. For this reason I gave up that style of trainning and went to ultra running. Since switching I’ve dove a lot of running including 2 x 24 hr obstacle races 100km +, 6 x 100 km trail runs average 4000m elevation gain, about 10 or more trail runs and obstacle races over 45 – 70 km and lots of smaller runs and obstacle races with no rhabdo symptoms at all. Dr Cunningham seems to think that I am predisposed to getting rhabdo in my upper body and it’s a genetic thing which is hard to pin point what my exact trigger point is. For this reason I have refrained from training upper body to the point of repeated failure and I have been rhabdo free ever since. If you would like more info I’m happy to chat and even share my medical records if it helps you. That is is really interesting, Steven. My initial thought is that I think most people tend to get rhabdo more easily from upper extremity workouts – or extensive intense workout of one muscle group (especially if that muscle is small). Humans are engineered evolutionarily to run long distances so perhaps our legs are generally strong enough to be resistant to rhabdo from running. You may have a bit of a genetic predisposition to rhabdo, but I am glad you have not developed it with running – and glad you had an excuse to start ultra running :-). Very informative and interesting read, thank you! 1. Spartathlon- got the finish and was wasted. Hadn’t peed in a bit, and was a bit wobbly, but that’s probably pretty normal after hammering for 153 miles on road. Anyway, what was scary was that the aid tent that they took me over to started giving me IVs. Not asking, giving. First one… I figured that was OK… then a second…. then they wanted to give me a THIRD. I hadn’t peed in a few hours, and didn’t feel like it. I’d been drinking fine and doubt I was particularly dehydrated. I got a bit freaked out, had them call a runner friend, and had him help me basically escape from their medical care. I told the several of the medical people giving the IVs that I hadn’t peed and that I was worried about rhabdo, but even though their English was good, that feel on deaf ears, they’d just smile about it and keep trying to add another IV bag. 2. TRT 100. Starting peeing a little blood around mile 45. But I felt great. Like, great. Not sore, not wobbly, not overworked, nothing, and it was only mile 45. So I made a pact with myself to ensure that I eeked out urine every 5-10 min, just to assure myself that I could pee. Yeah, that was a bit of a pace killer. But I basically peed every 5-10 min, just a tad, for the next 55 miles. Finished feeling pretty good, went to the med tent, and peed a nice brown into a cup for them. They were, to be sure, a bit horrified. After I stopped, I was peeing clear (to the eye) within 45 minutes, and saw a good local ultra-saavy doc in the next few days. Did kidney tests, etc., and it all seemed find. I believe our general conclusion was that there was definitely some bleeding, but it wasn’t rhabdo-driven; perhaps a broken blood vessel or something. As he noted: “I highly doubt you had rhabdo at mile 45 if you continued to run strong for another 55 miles and do well and feel well.” So, not REALLY a rhabdo story, but had one of the indicators. Tracy, Thank you for the helpful article! I am still a bit confused as to the relationship between hematuria and rhabdomyolysis. Is hematuria often a sign of rhabdomyolysis? Back in 2011, I dropped out of an ultra after about 50 miles due to bloody and then cola colored urine and abdominal pain. I went to the hospital and had a series of tests done, but everything was fine. Just this week, for the second time ever, I had bloody red urine and then cola colored urine after a hard 20k tempo run in new very firm racing flats without drinking any water before or after (although I did have some coffee). I usually run in padded hokas. My urine color cleared up within a couple hours. Is heamturie a red flag for possible kidney issues that should be checked out, and is there less concern if the cola color dissapears relatively quickly? Quigley, great questions. You are rightfully confused because it is a complex topic. The color of myoglobin (the product of rhabdo) in the urine should be brown and not red. One does not expect blood in the urine as an initial sign of rhabdomyolysis. Blood in the urine can come from a few sources: irritated bladder/urethra/prostate (could happen in running), hemolysis in blood vessels of the feet (march hematuria- which can also happen in running), or from damaged kidneys (could happen later in the process of rhabdo if it is severe enough). Perhaps you are not getting rhabdo at all but the blood in your urine becomes dark. I am not sure. But it is good all the tests you had done in 2011 were normal. It is not uncommon for runners to have blood in their urine for the above reasons, but just to be safe and reassured, since you developed it again, I would go get a urinalysis and creatinine test done at your convenience, just to make sure you have no bladder or kidney function issues. One possibility is that you have a blood vessel in your bladder or prostate that gets irritated and starts to bleed. If it keeps happening but all the tests are normal, you may consider seeing a urologist who can do a scope to see if there is an irritated bladder blood vessel. Just some thoughts, but if your resting urinalysis and creatinine are normal, you probably don’t need additional testing unless you are curious/concerned. Tracy, many thanks for your helpful and thoughtful response. I greatly appreciate you sharing your insights. It is probably more fun to worry about being chased by mountain lions or bears while running than rhabdo, but it is good to have on the radar and likely more common. Especially as I have been chased by mountain lions and bears, I should learn a bit more about rhabdo. Thanks! Thank you for this article-it was an informative read. I am a cyclist and recently got rhabdo at a 68 mile professional bike race in Arkansas. I had debilitating bilateral calf cramping and right sided medial quadriceps cramping (felt more like a searing/burning pain than typical cramps) at ~38 miles in. I rode another 30 miles to finish (had to stop pedaling multiple times due to cramping) and was still cramping 20 minutes after the race. They put me in the ambulance and my fingerstick glucose was 275 but vitals were normal. I didn’t get treatment and was sore to the touch for four days after. On day five I got blood work done at home and had a CK of 1057. Of note, I was born with a solitary kidney and my renal function was not affected. Wanted to share my experience as I have seen only one case report of rhabdo in road cyclists (versus spin class). Thanks! I just finished,barely, the Harrisburg marathon yesterday. It was my fifth and worse one ever. I have a tendancy to throw up on most runs over 16-18miles. Usually I will get sick once or twice, with dark urine, but by the next day most everything is back to normal. Yesterday at mile 17, I could already sense that I was going to be sick at some point. At mile 22, I threw up for the first time. In the next 4mi, I got sick 6 more times and again after the finish line. Went to the med tent and received a bag of IV fluids. Got sick 3 more times after. Every little sip of water made me dry heave. It took me 12hrs to finally pee and I was extremely alarmed at the dark brown color. This morning it is a dark orange. Since it is no longer brown, is that an indication that everything will be ok, or how do you know when to go to the dr? I’m just a little worried this morning. Not sure what to do, if this happens again.